The HY-TTC 500 product family is a high-end electronic control solution designed to satisfy upcoming needs for a wide range of high-end applications like construction and agricultural machines. The freely programmable high-end controllers with a powerful dual-core ARM Cortex®-R4 lockstep processor are protected by a compact, automotive-style housing suited for harsh environments. The controllers fulfill safety requirements up to SIL 2 (IEC 61508) / PL d (ISO 13849) and can be programmed either in C or in CODESYS®. The safety certified CODESYS Safety SIL 2 speeds up application validation significantly. The extensive I/O set with various configuration options makes the HY-TTC 500 controllers suitable for a wide range of high-end applications: For example, a group of 8 I/O pins can be individually configured for use as voltage output, digital output or analog input. Another use case is to build up a centralized architecture using one HY-TTC 500 controller for the whole vehicle. Commissioning time can be improved by using Ethernet for download and debugging purposes. The majority of run-time tests that is needed to achieve the diagnostic coverage required for SIL 2 / PL d are performed in hardware by the dual-core lockstep CPU and its safety companion. Therefore almost the full processor power is available for the application. 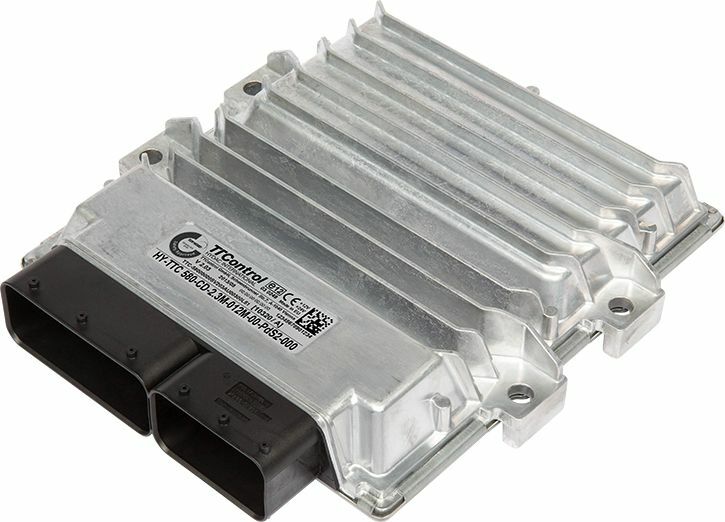 The available memory protection mechanisms allow executing safety and non-safety software on the same ECU without interference. The time-consuming validation of non-safe software is therefore no longer necessary. Safe data communication is achieved by the standardized CAN open Safety protocol. In a case of safety-relevant failure, outputs can be shut-off in 3 groups allowing limp-home functionality.